Battery Chargers High Frequency . Industrial . Energy Efficient FSIP stocks battery chargers to cover a wide range of applications from golf cars, to floor care & material handling equipment. Portable Stacking Racks • For storing or transport, these long-wearing racks save space & time. • Utilize vertical storage space by safely stacking these racks up to 5-high. • Forklift portable for easy handling of loads up to 4000 lbs & more. • Rugged construction features stand up to heavy industrial requirements. • Save time by moving more material with fewer moves. • Store product up and off the floor preventing product damage. • Racks store easily with little storage space required when not in use. • Standard rack designs/sizes can be changed to meet your specific needs. GENERAL PURPOSE TRAILERS Single end fifth wheel, front automotive or all wheel steering capabilities. Our equipment is of heavy duty, all welded steel construction capable of withstanding the roughest punishment. 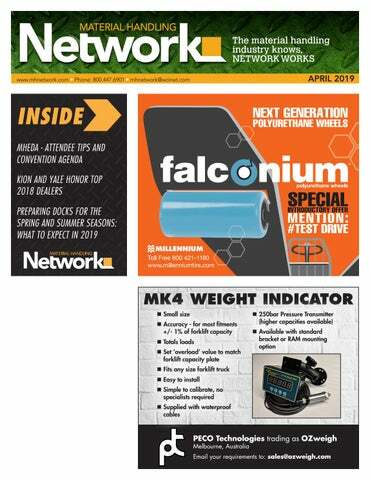 Material Handling Network (ISSN #2155-1685) is published monthly serving the material handling industry. Editorial opinion expressed herein are the authors and do not necessarily reflect the opinion of Material Handling Network. Material Handling Network assumes no responsibility for inaccuracies, errors or advertising content and reserves the right to reject or cancel any advertising for any reason, at any time. WetBulb Globe Temperature of 80.6 degrees (27 degrees Celsius) is associated with a worker output decrease of 4 to 9 percent. And when those temperatures stick around for more than a day at a time, each extra day of heat is associated with an increase of 1 to 2 percent in absenteeism, at least in jobs that don't penalize a few missed days of work. Given that loading and unloading truckloads at the dock can be awfully hot work, even in the best of weather, it'd be helpful to know what to expect as the summer begins. And, as you may have guessed, current estimates suggest there could be more heat than we're used to for most of the U.S. The National Weather Service's' Climate Prediction Center (CPC) projects that Texas, Oklahoma, and other central Southern states will see temperatures of 33 percent higher than normal in May, June, and July 0f 2019. Along the East Coast, and down into Florida, as well as in the Pacific Northwest, temperatures could be as much as 50 percent higher than normal during those months. So, for warehouse operators, especially those in the East, this might be the time to invest in extra high-volume, low-speed fans, additional water stations, and dock-related labor-saving devices like Dockmaster Bin Tippers. Heat and extra freight may be on their way, and preparing docks for these ongoing challenges will help to keep DCs productive, no matter what the season has to offer. For more analysis and material-handling tips, visit the BHS, Inc., Industry Knowledge Base at https://na.bhs1.com/category/industry-knowledge-base/. most popular sweeping pattern is 8 double row spiral wrap. Some of the most popular “brush fill patterns” are #1. A “Full Wrap“ Pattern #2 Double Row Spiral Wrap Pattern #3.Patrol Brush Pattern #4. Herringbone Pattern #5. Chevron Pattern and others. So when you are ordering your brush, remember these three things to decide whether you get a good scrub or an outstanding scrub. They are: #1.The Brush Bristle #2.The Brush Pattern #3. Whether you are using a rotary or cylindrical brush. You will be able to chose any brush for any machine using these three questions. Remember, the brush makes or breaks your machine ability. The brush does the cleaning. You can install the perfect brush for the application and your machine will perform perfect, or you can install the wrong application brush and your great machine will not perform. So, what I am finally saying is, that your brush makes-up your machine. A great sweeper or scrubber starts with a great sweeper or scrubber brush. If you need assistance in choosing the right brush application for you, shoot me an e-mail. I will get that right brush to you. It has been a pleasure writing to you today. Michael Creamer PS: Always remember: Brooms Sweep and Brushes Scrub ! Creamer’s Corner is a monthly conversation with Hi-Gear’s Mike Creamer giving you advice, technical assistance, brand comparisons and on the job stories on repairing, maintaining or replacing your sweeper/ scrubber. For your comments or questions, please e-mail Mike at networkeditorial@wcinet.com. Wet Dirty Lift Trucks Not An Option! Xtender Battery Regenerator Pair with a Battery Monitoring System (BMS) to wirelessly provide accurate data about the health of individual battery cells! decrease from 80% in February. None believe there will be a decrease in spending, unchanged from last month. Barring more international turmoil resulting from trade adjustments, we should be seeing positive leading indicators pointing to stronger growth by the time we exit 2019. We will look at which ones to focus on and just how good the rising trend might be. We are in a period of prosperity but that doesn’t mean it is without bouts of cyclical decline. Planning and timing the cycle will help you increase profitability. WOMEN IN INDUSTRY BREAKFAST & PRESENTATION Confident You: Bold, Energized & Resilient Presented by Jenny Evans, CEO, PowerHouse Performance Tuesday, May 7th from 7:00 am – 8:45 am. Confidence is the foundation for becoming a strong leader, pursuing challenge and taking risks. Lack of confidence not only holds women back, it holds companies back. Businesses lose out on innovation and productivity, while individuals miss out on opportunity and career advancement. Close the confidence gap in your organization and foster a culture of high-performing women on paths of improved self-assurance, performance and advancement. This program is available for all women attendees. Pre-registration is required. FISHBOWL NETWORKING Extended time in 2019! 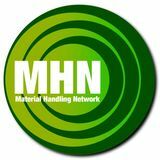 This even will take place on: Monday, May 6th from 3:00 pm – 4:15 pm Looking for a unique way to network with your material handling peers at MHEDA’s Convention? Join us for “Fishbowl Networking!” You will have the opportunity to share your perspective and experience on a variety of current industry issues ranging from changing buying preferences, next gen knowledge transfer, labor shortages and so much more! Topics will be picked out of a fishbowl. Don’t like the topic you pick? Throw it back in and pick another! It’s a fun, interactive way to learn from your peers. Monday, May 6th from 3:00 pm – 4:15 pm There are many other workshops for you to attend. Visit www.mheda.org to learn more. PROPANE & NATURAL GAS TECH! MHEDA offers a wide variety of educational sessions and workshops. Before you arrive in Phoenix, identify your must-see info sessions and speakers. Once you decide on those, build your schedule from there. Networking The networking components at MHEDA are just as important as the educational opportunities. This is a great time for you to meet people in the industry, ask questions and form lasting relationships. The schedule is jammed packed with networking opportunities, as well as social events that will give you ample opportunity to meet with your peers. It’s important to remember to not do everything at once. Pick the events that will work best for you and your schedule. Visit the Exhibitors Make time to attend the exhibitor showcase. This important aspect to the MHEDA Convention is only available for one day. With over 90 companies exhibiting, there is a lot to see. The expo gives you the opportunity to meet with the companies, like TVH, who you routinely interact with or want to get to know better. MHEDA’s annual convention is invaluable to all who attend. It’s a great opportunity to form new relationships and to strengthen existing ones. If this is your first time at MHEDA, or even if you are an old pro, don’t forget to take some time and stop by TVH’s booth (#501). We’d love to talk with you and welcome you to the show. 80,000 lb. to 120,000 lb. at 24” L.C. New ANSI-121 compliant deluxe siderelease wrist lanyard for small hand tools up to 5 lbs. The PD6 next-generation Platinum Series replaces the outgoing G06 Series and is UCA’s most heavy-duty pneumatic tire lift truck with a 13,000-22,000lb. capacity range. The new series offers an extended model lineup, increasing from three to six models, to cater to bigger market segments. The lineup includes the addition of 6T low-power and high-power offerings and a 7T low-power model. Under the hood is a highly-efficient Kubota v3800 Tier 4/CARB compliant diesel engine with improved fuel consumption. A large LCD panel replaces the G06’s mechanical screen, improving operator feedback. Wildeck’s innovative XpressLift™ VRC is designed to efficiently integrate vertical lifting into automated conveyor systems. When combined with your conveyor system, the XpressLift™ can help you achieve increased process efficiency through the automated vertical transfer of materials between your various conveyor levels. Easy to Integrate into your Material Handling Conveyor/Automation System, Easy to Install, Easy to Maintain and Designed and Manufactured to meet ANSI/ASME – B20.1 “Safety Standard for Conveyors”. WE’RE NOT BROKERS, WE OWN ALL OUR INVENTORY! that these campers take part in, help to connect the skills they learn during camp to career opportunities available in their community. We can’t start too early in our effort to attract the best and brightest into manufacturing.” Since 1998, the PMMI Foundation has provided over $2 million in financial support to students studying packaging, food processing, engineering and mechatronics at over 40 partner schools throughout the U.S and Canada. For more information visit pmmi.org/workforcedevelopment/foundation. About PMMI and the PMMI Foundation The PMMI Foundation works to grow awareness of careers in packaging and processing and provide assistance to schools and programs that develop students to excel in the industry. It offers financial support to students studying packaging, food and beverage processing, engineering and mechatronics at partner schools throughout the U.S. and Canada. Since its establishment in 1998, the PMMI Foundation has awarded more than $2 million in academic scholarships and donations. The PMMI Foundation is a part of PMMI, The Association for Packaging and Processing Technologies, which represents more than 850 North American manufacturers and suppliers of equipment, components and materials as well as providers of related equipment and services to the packaging and processing industry. About FMA and NBT The Fabricators & Manufacturers Association, International® (FMA) is a professional organization with more than 2,500 members working together to improve the metal processing, forming, and fabricating industry. Founded in 1970, FMA brings metal fabricators and equipment manufacturers together through technology councils, educational programs, networking events, and the FABTECH® trade show. The official publications of FMA include The FABRICATOR®, The Tube & Pipe Journal®, STAMPING Journal®, The WELDER®, The Fabricator® en Español, Canadian Metalworking®, and Canadian Fabricating & Welding. Learn more at fmanet.org. NBT awards scholarships and supports summer camp programs in efforts to engage, nurture and excite individuals of all ages in the pursuit of careers in manufacturing. Learn more at nbtfoundation.org. SUPERIOR ROLL HANDLER This modification allows the customer to handle large diameter reels or rolls without the fear of the unit rolling or damaging the product. Modifications made to the truck include widening the forks to accept the roll or reel, adding the angles to the fork to cradle the load perfectly and reinforcing the linkage, battery compartment and the overall construction of the pallet truck. midwest LIFT TRUCK SALES, INC.
that drives customer satisfaction and attracts new business," says Bob Sattler, Vice President of Dealer Business Development. "Each year, the Dealer of Excellence recipients demonstrate a commitment to continuous improvement and the safety of their associates, while meeting increasingly demanding recognition criteria. To consistently stand out among such a talented network of dealers is remarkable." The Dealer of Excellence program evaluates dealers against rigorous standards for customer satisfaction, service, rental, training, new unit sales, aftermarket, engineered products and general management. Program criteria evolve each year to ensure recognized dealers align with changing industry demands and customer expectations. 2018 Dealer of Excellence Recipients	Alta Equipment – Western Michigan Berry Material Handling Black Equipment – Indiana	Fitzgerald Equipment Burns Industrial Equipment – Pittsburgh	HILO Equipment Services Eastern Lift Truck Co. – Baltimore/DC/DE and PHL/S. Jersey	Medley Material Handling Fairchild Equipment – North	NITCO – Boston Gregory Poole – Carolinas	Riekes Equipment Papé – Central Washington and Eugene	Tynan Equipment Co. Wheeler Material Handling – Alabama and Tennessee The Yale Dealer of Excellence Award recipients will be honored with a special celebration at The Ritz-Carlton, Dove Mountain in Marana, Arizona. They represent high performers from the nation's largest independent dealer network, offering responsive, local support. Step outside the four walls of your facility and discover inspiration from new sources across our dynamic industry. Join us at WERC 2019 and ﬁnd a spark that will ignite new energy in you and your team. Your direct connection to the Material Handling Industry’s hottest trends, newest products, best management training workshops & represents a wealth of resources for all material handling businesses. North America’s online directory of distributors and dealers selling material handling products and services; the forum where end users find local equipment suppliers. ✓ Remanufactured engines ✓ Engines in-stock for same day shipment ✓ Quality assured workmanship from people who know the business! EXHAUST ANALYZERS Visit our website to learn more about reducing carbon monoxide (CO), saving fuel and operating equipment at peak performance. OSHA FORKLIFT TRAINING Nationwide forklift training programs designed to be fully OSHA 1910.178 compliant. We provide on site training that includes: • Train the Trainer • Classroom training • Hands on driver training • Operator evaluations On all types, models and brands of Powered Industrial Truck equipment and Aerial Work Platforms. We offer the Best Customer Service in the industry. Quotes in 24 hours. WILL MODIFY OEM SIZES TO FIT YOUR SPECS. Original & Aftermarket Parts for Most Equip. NEED A TRANSMISSION REBUILD KIT? OUR KITS ARE DESIGNED FOR TECHS, BY TECHS! ◆ AIT CARRIES KITS FOR MOST TRANSMISSION STYLES. • Do you have equipment to sell? • Are you looking for more dealers? • Is your website outdated or hard to navigate? • Do you need help with publicity or copy-writing? • Do you think direct mail is too costly? • Is your client list shrinking? • Does Social Media confuse you? American Industrial Transmission Inc. 800-588-7515 sales@aittransmission.com www.aittransmission.com The advertisers’ index is an extra service to the advertisers. The publisher does not assume liability for errors. Our Primary Goal is to support our dealers, satisfy their customers, earn trust and be the “Vendor of Choice” for rack products and racking systems. We offer a full line of light duty, intermediate duty, heavy and extra heavy duty cantilever racks. We provide multiple configurations of a wide variety of stacking racks. Our structural pallet racks can be configured for a wide range of applications. West Point Rack h as the products that generates solutions for your storage needs. We also offer specialty products such as bar cradle trucks, drum racks, hand carts and other specialty transport and storage products. Give us a call at 866.245.3630. We may have what you need. Look forward to hearing from you.